Born in Toldeo, Ohio in 1860, Henry Charles Trost was the son of German immigrants. His father, Ernst Trost, was a carpenter and building contractor and his mother, Wilhelmina, managed the family grocery store. Henry gained a thorough working knowledge of his craft from his father and showed a special inclination and talent for architecture at an early age. After graduating from art school, Trost worked as an architectural draftsman until 1880. For the next eight years, he traveled west, living and working in various cities from Colorado to Louisiana, with several stops in Texas. From 1888 to 1896 he was a designer of ornamental metal in Chicago where he was greatly exposed to the architectural works of Louis Sullivan and Frank Lloyd Wright. Henry Trost’s personal interests in both the ornament of Sullivan and the form conventions of Wright may be inferred from much of his work. In the late 1890’s, Trost experienced the booming, thriving atmosphere of the American West. During this restless period he was influenced by many architectural styles and designs. In 1903 Henry joined his brother Gustavus Adolphus Trost in El Paso, Texas and formed the architectural firm of Trost and Trost. They were assisted by a nephew, George Ernst Trost . Gus’ twin brother, Adolphus Gustavus Trost, (Ad), a structural engineer, joined the family business in 1908. The firm was immediately successful. Commissions arrived from throughout West Texas, New Mexico and Arizona. For almost 30 years, Henry served as the principle designer and developed some of the region’s most striking and unique buildings. Almost every type of building and structure was created by Trost and Trost including office buildings, private homes, hotels, theaters, lodges, religious buildings, department stores, apartment buildings, and even a penitentiary. The firm designed more than 250 buildings for elementary schools, high schools and universities. The Kerr Mercantile in Sanderson, The Gage Hotel in Marathon, The Holland Hotel in Alpine, The Hotel Paisano in Marfa and The Hotel El Capitan in Van Horn are all lasting landmarks of Henry Trost’s architectural legacy. The Kerr Mecantile and The Gage Hotel were both constructed in 1927. The Mercantile is a fine example of Trost’s progressive commercial architecture. Constructed of concrete and brick, the building features a second floor mezzanine that is typical in many Trost designs. 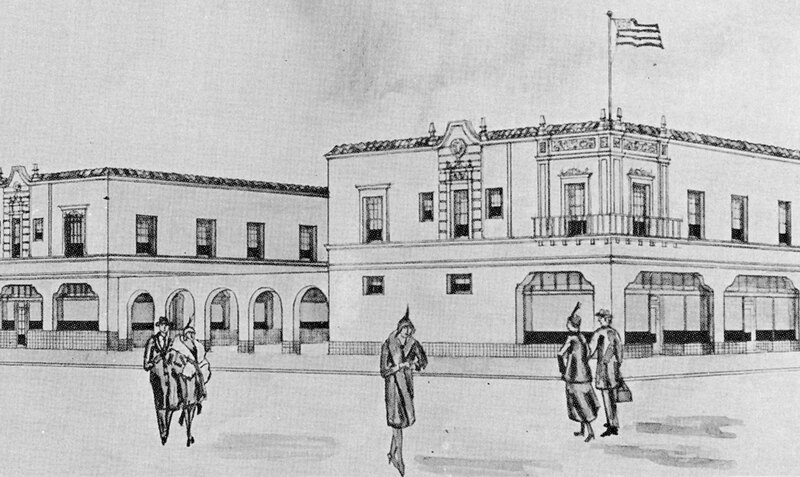 While Trost was adept at designing in almost any architectural style, many of his designs while in El Paso, including those in the Big Bend area, were of the Spanish Colonial Revival style which had been popularized along the railway towns of the Southwest. The Gage was designed as both hotel and ranch headquarters for the 500,000 acre ranch. The design of the building shows the influence of the Spanish Colonial Revival, sometimes called Mission Style. Manifestation of Louis Sullivan’s influence is seen in Trost’s implementation of ornamentation on the exterior façade. Trost employed cast-in-place concrete ornament. The coarser technique called for a more simplified morphology than Sullivan’s finely detailed work in terra-cotta. Thus, many of Trost’s designs, including his hotel designs in West Texas, employ plateresque concrete ornamentation. The Hotel Paisano and The Hotel El Capitan were opened in 1930. These hotels were two of the five Gateway Hotels from the hotel chain developed by Charles Bassett in an attempt to encourage tourism within 200 miles of El Paso. Trost took special care in the detailing of the interiors of his buildings, as can be seen in The Hotel Pasiano and The Hotel El Capitan where there is extensive use of glazed tile, wrought iron, interior archways and exposed wooden beams. Among the finest features of many of Trost’s interior designs are the interlocking spaces of the lobby, lounge and dining areas, often in a series of multi-level spaces approached by short flights of stairs. Sadly, The Kerr Mercantile is not presently occupied as a business but remains on the historic walking tour of Sanderson. After a number of years as The Van Horn State Bank, The Hotel El Capitan is once more welcoming travelers passing through far West Texas. The Hotel Paisano has returned to its former glory as one of the “grandest hotels between El Paso and San Antonio,” and The Gage and The Holland continue to be accommodation destinations for travelers to the Big Bend area. Trost died in El Paso in 1933. Although the architectural firm continued work until the 1950’s, none of the later buildings were significant. Scarcely a single major city in the Southwest was untouched by the innovative designs of Henry Trost, and, thankfully, he left his mark on more than a few smaller cities and towns of West Texas.